During the 2016 legislative session, the GMNP supported Gov. Mark Dayton’s recommendation that the broadband program receive $100 million. The DFL-led state Senate favored $85 million for 2016-17 while the Republican controlled House supported spending $15 million. The House wanted to invest far less and argued for keeping most Greater Minnesota Cities ineligible for grant funds. GMNP’s support was contingent on language changes in the statute that would make grant eligibility easier for non-metro cities. “Without major reforms to the eligibility for funding we assumed it would be difficult to get to the $100 million that Gov. Dayton and Lt. Gov. [Tina] Smith wanted,” Dorman said in an end-of-the session update website post to his members. Second, the ongoing language challenges with the Border-to-Border Program. “With 85 percent of people living in cities not eligible for [Broadband Development Grant] funding, it’s hard to get people excited [about the program],” Dorman told us. The Partnership; a 90 member group of economic development authorities, foundations, cities, nonprofits, businesses, and Chambers of Commerce; maintains the broadband program’s rules and criteria inadvertently harm the very cities that conceived the program. Established in 2014, the Broadband Development Grant program was designed to “bring high-speed Internet access to unserved or underserved areas of the state” and help provide opportunities to help existing businesses and attract new ones. The Legislature, in its 2016 legislation, reaffirmed that an unserved area is one where households or businesses lack access to wireline broadband service at speeds that meet the FCC definition of broadband which is 25 Megabits per second (Mbps) download and 3 Mbps upload. Because the grant program has focused heavily on unserved areas, it has largely ignored the majority of cities that are “underserved,” those that have some Internet service, albeit poor, Dorman said. This has created what the Institute for Local Self-Reliance described in our policy paper “Minnesota’s Broadband Program: Getting The Rules Right” as “donut holes,” where a city has much poorer service than its surrounding rural areas. Our fear is that towns with a moderate level of current business investment could lose that as businesses flock to more rural areas where the Internet infrastructure is better. Other investment would follow and the small cities in Greater Minnesota would find themselves at a disadvantage. It’s an unintended consequence that policy makers need to consider. Fortunately, lawmakers listened to the GMNP, the Star Tribune, and us as they established rules for funding this session. In our policy paper, we recommended that the Border-to-Border fund should set some portion – less than half – of its funds aside for applications that would target the underserved population centers and blend them in with nearby unserved areas. Those business and industry centers are the economic heart of many regions and they need modern connectivity for Minnesota to thrive. Dorman said one significant victory in the newly-passed state broadband grant law is that $5 million of the $35 million appropriation will be set aside for areas that currently have speeds greater than 25 Mbps down and 3 Mbps up but less than 100 Mbps down and 20 Mbps up. That $5 million will be available to communities that need better broadband service to boost economic development. The federal “investments” are largely from the Connect America Fund, which has is effectively wasting billions of dollars on antiquated DSL service. On the downside, the Partnership was disappointed in a provision in the broadband law pertaining to a “challenge process” that allows a telecom company to stop a project from receiving a grant if that company currently provides or even promises to provide service at the low state speed goals, Dorman said. This legislative language is a slight reform of the previous “right of first refusal” language, which had been included in the House broadband bill. Dorman sees the “challenge process” language as a tool protecting telecom companies “that don’t want to invest” in their Internet networks. “Any broadband provider in the area can object” to an applicant’s request for grant funding, Dorman said. This is potentially more open-ended than the old language that gave this challenge authority only to incumbent providers in an area, he said. Whatever the reasons for the legislative changes, Dorman decried the lack of opportunity for public comment on the “challenge” language. Meanwhile, Dorman blamed industry telecom lobbyists for convincing state lawmakers not to support the language changes sought by Partnership. “This [new Broadband Development Grant law] was written with the help of the [telecommunications] industry," he said. In another area, GMNP leaders also believe the state’s connectivity speeds goals are not aggressive enough. Under the law, the state’s goal is that “no later than 2022,” all Minnesota businesses and homes have access to minimum speeds of 25 Mbps down and 3 Mbps up and the minimum service goals in 2026 should be 100 Mbps down and 20 Mbps up. 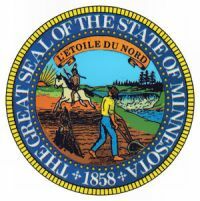 Moving forward, Dorman said his organization may have to re-evaluate if there is a better and faster way to get high-speed Internet connectivity to greater Minnesota if dramatic improvements don’t come soon to the Border-to-Border Broadband Development Grant program.